Personalized Squeeze Coin Pouches Custom Printed in Bulk. Promotional, Inexpensive, Soft Leather Look. Budget Prices in the USA and Canada. 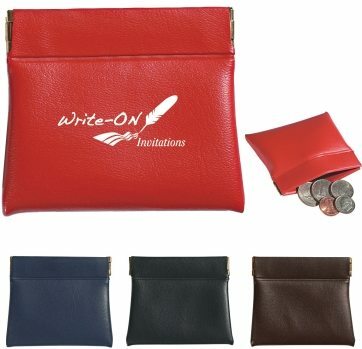 Leather Imitation squeeze coin pouches personalized with your logo. We also supply wholesale blank (not personalized) squeeze coin pouches at EQP (End Quantity Price). Budget Prices in USA and Canada. American clients pay no taxes.